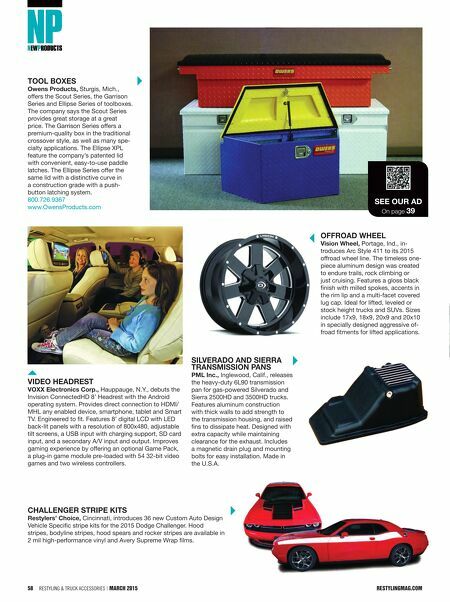 58 Restyling & tRuck AccessoRies | March 2015 restylingmag.com TOOL BOXES Owens Products, Sturgis, Mich., offers the Scout Series, the Garrison Series and Ellipse Series of toolboxes. The company says the Scout Series provides great storage at a great price. The Garrison Series offers a premium-quality box in the traditional crossover style, as well as many spe- cialty applications. The Ellipse XPL feature the company's patented lid with convenient, easy-to-use paddle latches. The Ellipse Series offer the same lid with a distinctive curve in a construction grade with a push- button latching system. 800.726.9367 www.OwensProducts.com SEE Our Ad On page 39 VidEO HEAdrEST VOXX Electronics Corp., Hauppauge, N.Y., debuts the Invision ConnectedHD 8' Headrest with the Android operating system. Provides direct connection to HDMI/ MHL any enabled device, smartphone, tablet and Smart TV. Engineered to fit. Features 8' digital LCD with LED back-lit panels with a resolution of 800x480, adjustable tilt screens, a USB input with charging support, SD card input, and a secondary A/V input and output. Improves gaming experience by offering an optional Game Pack, a plug-in game module pre-loaded with 54 32-bit video games and two wireless controllers. OffrOAd WHEEL Vision Wheel, Portage, Ind., in- troduces Arc Style 411 to its 2015 offroad wheel line. The timeless one- piece aluminum design was created to endure trails, rock climbing or just cruising. Features a gloss black finish with milled spokes, accents in the rim lip and a multi-facet covered lug cap. 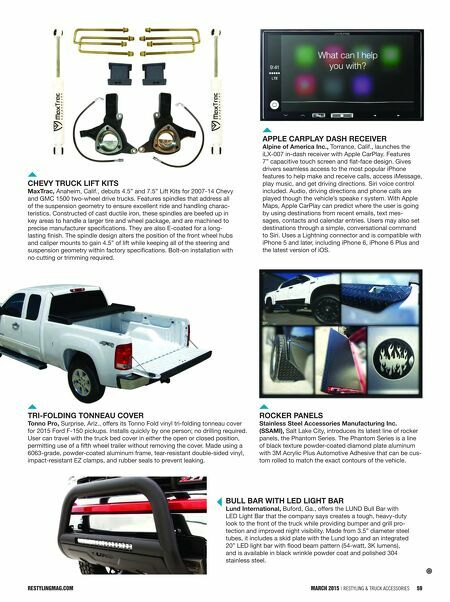 Ideal for lifted, leveled or stock height trucks and SUVs. Sizes include 17x9, 18x9, 20x9 and 20x10 in specially designed aggressive of- froad fitments for lifted applications. SiLVErAdO And SiErrA TrAnSmiSSiOn PAnS PmL inc., Inglewood, Calif., releases the heavy-duty 6L90 transmission pan for gas-powered Silverado and Sierra 2500HD and 3500HD trucks. Features aluminum construction with thick walls to add strength to the transmission housing, and raised fins to dissipate heat. Designed with extra capacity while maintaining clearance for the exhaust. Includes a magnetic drain plug and mounting bolts for easy installation. Made in the U.S.A. CHALLEngEr STriPE KiTS restylers' Choice, Cincinnati, introduces 36 new Custom Auto Design Vehicle Specific stripe kits for the 2015 Dodge Challenger. Hood stripes, bodyline stripes, hood spears and rocker stripes are available in 2 mil high-performance vinyl and Avery Supreme Wrap films.